WWW.ILTANET.ORG 59 deliverables they created. If they go into solo practice after passing the bar, they will be better equipped to face technology- related challenges and compete in the legal marketplace. As another example, Stanford Law School created a course in legal technology and informatics in 2013. They encourage other schools to consider adding similar courses to their curricula. Beyond practical some of the leading experts in law practice management from across the country, rather than attempting to depend on local, adjunct professors or tenured faculty who might not have relevant experience in law practice management and technology. Courses through the CLPT include: • Law practice technology and management • Social media and the law • Legal document automation • Training lawyers as entrepreneurs • Ethics of practicing law in a digital world • Legal project management • E-discovery project management • Legal process redesign • Access to justice and legal technology Students learn skills such as how to create a virtual law firm, automate legal documents, leverage social media to develop a brand and ensure legal services are delivered ethically using technology. Students are given access to several technology platforms, and the course assignments require they learn how to navigate and produce work product with these tools. Upon graduation, these students will have a portfolio to provide to prospective employers that showcases their training, acquired skills and the technological advances. Law schools must also prepare students for new and changing roles such as legal knowledge engineer, legal technologist, legal hybrid, legal process analyst, legal project manager, ODR practitioner, legal management consultant and high-risk manager. Every lawyer must have some of the skills embodied in these job descriptions, if only to hire or retain these specialists who will then augment or participate in legal work produced by law firms, in-house legal departments, courts, clinics, etc. In addition, many of these skills are necessary for the budding legal technology startup industry. 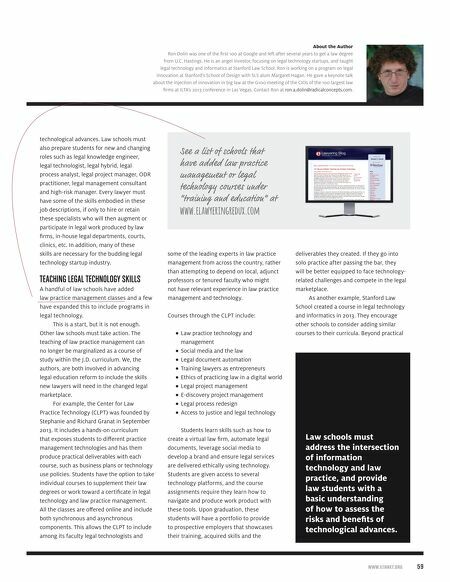 TEACHING LEGAL TECHNOLOGY SKILLS A handful of law schools have added law practice management classes and a few have expanded this to include programs in legal technology. This is a start, but it is not enough. Other law schools must take action. The teaching of law practice management can no longer be marginalized as a course of study within the J.D. curriculum. We, the authors, are both involved in advancing legal education reform to include the skills new lawyers will need in the changed legal marketplace. For example, the Center for Law Practice Technology (CLPT) was founded by Stephanie and Richard Granat in September 2013. It includes a hands-on curriculum that exposes students to different practice management technologies and has them produce practical deliverables with each course, such as business plans or technology use policies. Students have the option to take individual courses to supplement their law degrees or work toward a certificate in legal technology and law practice management. All the classes are offered online and include both synchronous and asynchronous components. This allows the CLPT to include among its faculty legal technologists and About the Author Ron Dolin was one of the first 100 at Google and left after several years to get a law degree from U.C. Hastings. He is an angel investor, focusing on legal technology startups, and taught legal technology and informatics at Stanford Law School. Ron is working on a program on legal innovation at Stanford's School of Design with SLS alum Margaret Hagan. He gave a keynote talk about the injection of innovation in big law at the G100 meeting of the CIOs of the 100 largest law firms at ILTA's 2013 conference in Las Vegas. Contact Ron at ron.a.dolin@radicalconcepts.com. 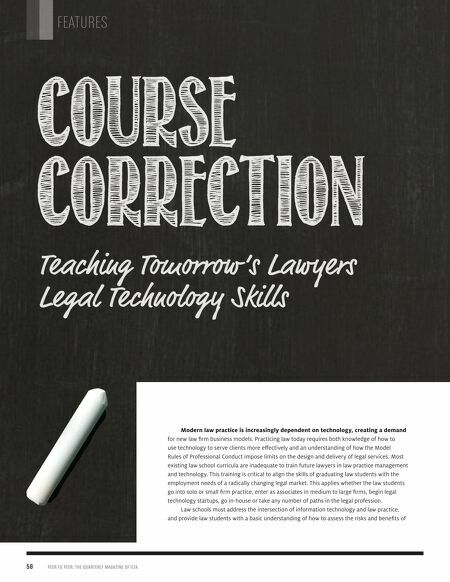 Law schools must address the intersection of information technology and law practice, and provide law students with a basic understanding of how to assess the risks and benefits of technological advances.